The verbosity – how many words beginning with ‘v’ can you cram into a single sentence? 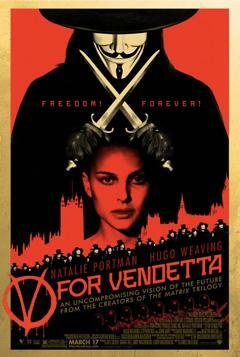 What Makes V For Vendetta a Dystopia? The film strays somewhat from the perspective of the comic, but its background comprises a totalitarian state with overtones of George Orwell’s ‘Nineteen Eighty-Four’ – it also borrows heavily from that movie’s imagery, including the distinctive ‘V’. Interestingly enough, the ‘V’ has been shifted from Nineteen Eighty-Four‘s Ingsoc ‘V’ Logo representing the authority structure, and now the ‘V’ represents the dissident, the rebel. At the same time John Hurt has shifted in the opposite direction, from the oppressed citizen in Nineteen Eighty-Four, to the oppressor in V For Vendetta. Are the Watchowski Brothers trying to tell us something? The regime maintains its power through a potent combination of media supremacy which dulls everybody’s minds and effectively brainwashes everyone into believing in the status quo, and a strong military presence which lurks in the shadows but is nevertheless swift to appear and violently put back in their place anyone who dares to break the rules. Against this draconian background, the authorities have much scope for further dark and cruel projects designed to extend and solidify their position of power. Such projects would include the one that ‘V’ himself became a victim of, but these are always covered up so that the unsuspecting public has no idea. This authoritarian and slightly hysterical society is an ideal breeding ground for pathological figures to thrive, to easily rise up the ranks into positions of power. The movie provides us with several such characters who use this environment, to get away with abusing the weak and the vulnerable whilst maintaining an air of legitimacy. This is a violent, stark, but also thought provoking movie, which poses some difficult questions and causes us to reflect on our modern civilisation and its potential paths: Does our current society represent freedom for all, or only freedom for the elite and oppression for the masses? What part does society play in creating the monsters that it purports to oppose? How are manufactured threats used to justify draconian rule? Is it acceptable to use violent resistance against violent oppression? Can peaceful rebellion be effective? Is martyrdom a valid path? To what extent do we become the society we inhabit? How can one defend liberty against the potential threat of encroaching fascism? What would you do? Hugo Weaving makes an excellently creepy and mysterious central character, ‘V’, the self prescribed ‘lone defender’ of universal liberty, turning the tables on his previous role as Agent Smith in The Matrix (as an instrument of oppression). Natalie Portman is one of those precious American actors who can turn a credible English accent. In her character Evy, we are invited to share her journey from vulnerable victimhood and awakening to the horrors around her, to a self-assured enlightenment of sorts, in which she is given the liberating but daunting responsibility for forging her own destiny. Supporting roles include the brilliantly scary John Hurt as the foaming-mouthed fascist dictator Sutler, and Stephen Fry as Gordon Deitrich, the dark-horse public personality with a dangerous secret and a heart of gold. The movie is based on the graphic novel of the same name, by Alan Moore, which adds a whole extra dimension when we try to understand the motives and meaning behind the movie. The movie varies significantly from the comic, generally because of the Wachowski brothers’ influence and the overlay of their views onto the original story, as well as the different limitations of the film format. Alan Moore wrote the original against a background of the Thatcherite capitalist boom of the 1980s, as an exploration of fascism versus anarchy in which fascism exists mainly due to the apathy of its opponents to do anything different. Whereas the political mood of the movie has shifted somewhat and there are allusions to, for example, the American neo-conservative versus liberal debate. In the comic, the character ‘V’ is a charming but ruthless psychopath – however in the movie he is given a more human edge who is intended to be, at least compared to the comic-book version, a more likeable character. Another change is the kidnapping of Evey, which was originally told as the brutal coercion of a vulnerable youngster into an imposed set of political views. In the movie, this has morphed into a more Gurdjeiffian or Gnostic tale of personal transformation or ‘ascension’ via strength of character overcoming internal barriers: the breaking down of the old and the birth of the new ‘super being’. This is an idea that can be found almost universally across many New Age doctrines, and is not too dissimilar to themes portrayed in the Wachowski Brothers’ other very successful movie: ‘The Matrix’. It is rather interesting that the ‘V’ mask (and indeed the whole movie) has become something of an icon amongst modern day alternative political commentators, who speak out against the current global political trends and the parallels between the fascism on screen and the fascism in real life. The ‘V’ masks have become a common sight at anti-globalist demonstrations outside Congress, Parliament, or Wall Street. It is especially popular with the activist network ‘Occupy’, as well as the highly active internet group known as ‘Anonymous’. It becomes particularly ironic once you learn that one of their key targets of rhetoric is what you might call the global conspiracy of the elites against the common man. This runs in direct contradiction to Alan Moore’s own self-professed belief that “there is no conspiracy”, and that everything acts within an environment of chaos where things “just happen”. He further says (in the documentary ‘The Mindscape of Alan Moore’) that conspiracy theorists believe in a conspiracy because that is more comforting than the frightening idea that the world is rudderless with no-one in control. But that is not all, Alan Moore is strongly invested in what he calls ‘magic’. More specifically he is referring to the mindset of such individuals as Alistair Crowley (founder of Ordo Templi Orientis, and member of the Hermetic Order of the Golden Dawn) and other self-professed ‘satanic’ organisations such as Theosophy (creator of the ‘Lucifer Trust’). Moore explains this ‘magic’ as a technique of altering society and the perceptions of mankind through the manipulation of words and symbols, and he states that this is a very powerful method, which modern day wordsmiths completely underestimate. He is also a strong proponent of anarchy as “the only sane way” that things should be run, and in the comic he cite’s Crowley’s well known creed “Do what thou wilt shall be the whole of the law”. The problem is that the rather bizarre organisations on which this philosophy is founded, whatever their real natures, are indeed closely linked to many high profile political figures and institutions such as the United Nations that, for example the ‘Occupy’ collective, would consider very definitely a “part of the problem”. This presents us with an immediate paradox when we look at the surface level message that Moore is portraying, and the way that many people seem to be interpreting it. Whatever your political views or conclusions, this a fascinating multi-layered movie that deserves to be seen. To use a much loved cliché of lazy journalism: it is a modern classic which should “never be forgot”.